It is difficult to believe that Britain’s best-selling plant, that flamboyant adornment of Christmas tables, the Poinsettia, is related to the native wood-spurge. Both are members of the Euphorbia family and, along with about 2000 other species, form one of the largest genus of flowering plants in the world. So successful has the evolution of Euphorbias been that they are found in tropical and temperate areas, from deserts to woodlands, throughout the world. The only continent they haven’t reached is Antarctica. As might be expected in such a large genus, the variety of plant types is enormous, from tiny succulents to massive trees by way of annuals, perennials and shrubs. 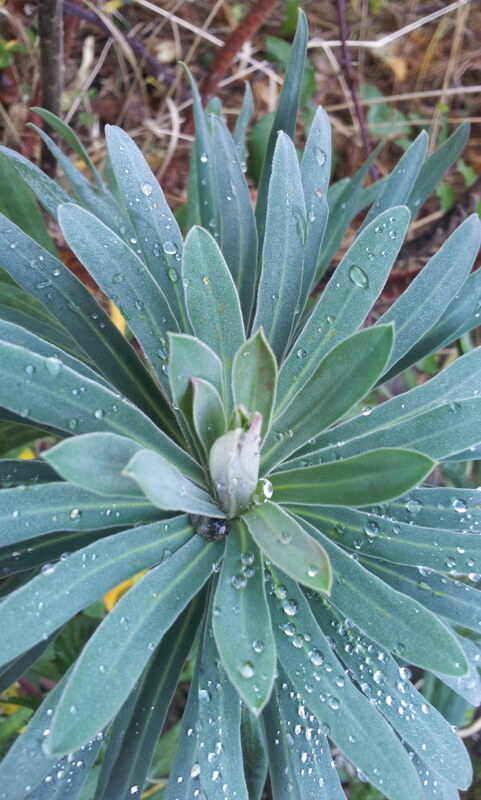 The Euphorbias most suited to British gardens are the leafy, perennial species. The flowers are usually tiny, surrounded by leaf-like bracts that give the impression of large flower-heads. In general, the bracts are in shades of yellow, from ashen cream to bright, acid yellow. I once overheard a garden visitor mutter that it was impossible to become excited by Euphorbias – “why doesn’t he plant something with some colour?”. In fact the vivid yellow and green flowers of euphorbias bring a freshness and vitality to the garden that few other plants can. And the cool green or glaucous-blue of the evergreen forms add beef to the garden during the winter. By carefully choosing different species you can have these qualities in the garden from April through to September. 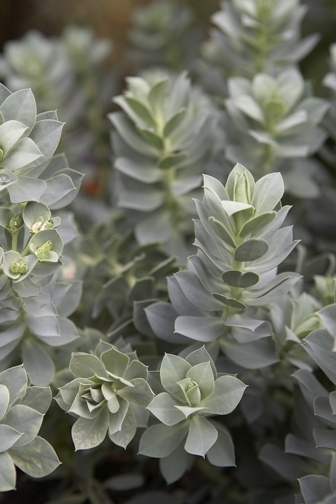 Fortunately plant breeders and nurserymen are continually selecting improved cultivars of old favourites and introducing unfamiliar species, making an even wider range of euphorbias available. The earliest to flower in my garden is Euphorbia myrsinites. Driving around the Mediterranean in April you will see its yellow-green starry flowers hugging the roadside. These inhospitable conditions give a clue to how to grow it in the garden: in poor, sun-baked soil away from moisture. The straggly stems, covered in whorls of glaucous leaves, reach 30cm long and sprawl out along the ground. Tulipa sprengeri and Tulipa clusiana enjoy the same conditions and both look stunning growing through the angular foliage. After a few years the centre of the plant can become woody and ugly, but there are always lots of new seedlings around, so be ruthless: rip out the old plants and let the new ones flourish. The Mediterranean is also home to Euphorbia characias, a handsome evergreen that has become a classic garden plant. In the wild you see wide variations in the plant, but the cultivated form has narrow flower spikes that are a muted greeny-yellow colour with a brown centre. The subspecies Euphorbia characias subsp wulfenii has wider flower heads and brighter flowers with a yellow centre. The variability of the species has led to the development of many garden cultivars. One of the most attractive of these recent introductions is Euphorbia characias ‘Portugese Velvet’. The leaves are a much darker green, with rolled edges and a velvety texture. The plant grows into a dense hummock about 70cms tall, providing a good contrast with silver-leaved lavenders. The biennial sea-holly, Eryngium giganteum, has seeded itself around my plants, giving one of those wonderful, chance combinations that we all wish we could have thought of. The silver of the sea holly sparkles against the dark green of the euphorbia. ‘Portugese Velvet’ is more tender than other cultivars and so needs very well drained soil. Gardeners in the cold parts of Scotland and the north of England might have problems keeping it through the winter. As its name suggests, Euphorbia characias ‘Humpty Dumpty’ is a compact, rounded plant that grows to about 80cm tall. It is very floriferous, producing masses of soft-yellow flowers heads in April and May. For something more imposing try Euphorbia characias supsp wulfenii ‘Lambrook Gold’, which will grow to 1.2m tall with large chartreuse flowers. The smallest and bluest of recent introductions is E. characias ‘Blue Wonder’, at only 60 cm tall. The metallic-blue leaves keep their colour throughout the winter. There is a brightly coloured white and green variegated form called Euphorbia characias subsp. characias ‘Burrow Silver’ . It’s a very tempting plant when you see it on nursery sales tables but, in my experience, is a weedy plant that usually loses its struggle to live after a couple of years. A similar form, Euphorbia characias ‘Kestrel’, has variegated foliage with a pink tinge to the leaves in winter. Spotted as a seedling in a Gloucestershire garden, it was introduced two years ago by Cotswold Garden Flowers, who claim that it is sturdier than other variegated forms. Gardeners who don’t have the hot and dry conditions that the Mediteranean species require should try Euphorbia grifithii. Native to the eastern Himalayas it prefers cool situations and rich soil. The sumptuous cultivar ‘Fireglow’, which was introduced by Alan Bloom, has intense, ember-red foliage. Euphorbia grifithii ‘Dixter’ has darker foliage and burnt ochre flowers. The powerful, thick new shoots of both these plants are full of exciting vigour in early spring as they muscle their way up amongst daffodils and early tulips. There is a euphorbia for all soil types and for all situations in the garden. The native perennial wood spurge, Euphorbia amygdaloides, is best in shady conditions where its flowers add a sparkle to dark corners. Margery Fish described the flowers as being ‘love-bird-green’. It has hybridised with E characias to form Euphorbia x martinii, which has grey-green leaves on red stems and lime-green flowers. Both of these plants are very susceptible to mildew, a problem that does not seem to occur on a new euphorbia, adapted to growing in shade, Euphorbia ‘Whistleberry Garnet’. 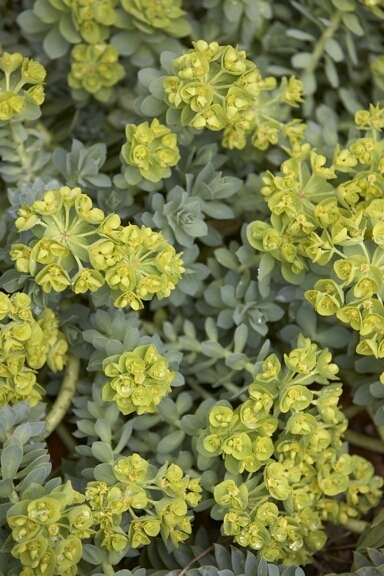 Marketed by wholesaler Whistleberry Nurseries, who have recently introduced several new euphorbias, it grows about 60cm tall and has large, rounded deep green leaves that it keeps during the winter. Another plant that is at home in shady, woodland conditions is Euphorbia dulcis ‘Chameleon’. The foliage is a mixture of green mahogany and purple throughout the summer until the whole plant turns bright red for a fiery autumn finale. When you are buying it, check that the foliage is not predominately green. Some plants being sold under this name have been raised from seed and are pale imitations of the true cultivar. Prompted by reference works about eupborbias, especially Roger Turner’s ‘Gardeners’ Guide’, specialist nurseries are beginning to sell hitherto neglected species. My own current favourite, Euphorbia baselicis, has a startling combination of red stems with tightly-packed grey leaves and lime flowers. It forms a floppy plant about 30cm tall and, despite its Mediterranean origins, has survived the last three winters in Hertfordshire, unlike the honey spurge, Euphorbia mellifera, which succumbed to the cold and wet of last year. If you can find a sheltered spot for E. mellifera, it is worth taking a chance on. A substantial plant, up to 1.5m in most British Gardens, it has apple-green foliage and hazelnut-coloured flowers. Best of all, though, is the honey-perfume the flowers give off. The Chelsea Physic Garden, in London, has a huge specimen. It’s worth making a special visit when the plant is in flower just to enjoy the scent. A very similar species is Euphorbia stygiana. The leaves are the same bright-green, with a pale midrib, and turn deep red in winter. 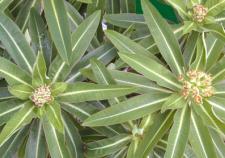 It is being promoted by some nurseries as a hardy alternative to Euphorbia mellifera. Most euporbias need to be grown in a sunny situation in a well-drained soil. Euphorbia grifithii will tolerate some shade and grows better on heavier soils, which also keeps in check its tendency to run about. Euphorbia amygdaloides and Euphorbia x martinii need shade and rich soil to thrive. All euphorbias exude a white, latex-like, sap when the stems are broken. This is an irritant and can cause inflammation on sensitive skin. Some gardeners wear gloves when handling euphorbias; you should wash your hands immediately if you get any of the sap on them. One of the benefits of this poisonous sap is that Euphorbias are attacked by very few predators. Rabbits and deer will not touch them. It is easy to raise your own euphorbia plants. Euphorbia dulcis and Euphorbia griffithii can be divided in early spring in the same manner as other herbaceous perennials. Euphorbia species grow easily from seed. The seed germinates easily and does not need heated propagators. Cultivars of Euphorbia characias have to be propagated by taking cuttings. This is best done in April when the plant is making lots of new growth. Remove the new shoots at the base (ones about 5cm long are the best) and immediately dip the end into a pot of horticultural sand to stop the sap from oozing out. Don’t remove any leaves, as the sap will leak out of the wound and weaken the cutting. Pot the cuttings into a well-drained cuttings compost. It is important not to over-water the cuttings and to keep them in a dry environment. Moisture in the atmosphere around the cutting will cause it to rot. As soon as they are rooted pot them into potting compost and plant them out in the garden the following spring. The name Euphorbia is thought to commemorate Euphorbus, the first-century doctor, physician to King Juba II, a client-king of the Roman Empire who ruled Mauritania. According to Pliny, Juba himself was far more learned than his doctor: he wrote several books on Natural History and supposedly the first European to use euphorbia medicinally. The palm, Jubea chilensis is named after him. The most famous doctor of the time was not Euphorbus but Antonius Musa, who had a statue raised in his honour. This caused Linnaeus, in one of his more reflective moments, to meditate on the nature of fame. Musa and his bronze statue are long-forgotten, whereas Euphorbus is remembered in the name of a plant. Only plants and their names, wrote Linnaeus, will endure. The common name ‘spurge’ is a reference to the purging qualities of the seeds of some euphorbias in early medicine. The medicinal use of euphorbias is also found in Islamic herbals, in Traditional Chinese, and in African medicine.